Computational modeling produces both prospects for better catalysts and beautiful images, like this model of a platinum catalyst interacting with oxygen atoms (red) and hydrogen atoms (white). Image by Rees Rankin, Center for Nanoscale Materials. Catalysts are one of those things that few people think much about, beyond perhaps in high school chemistry, but they make the world tick. Catalysts are all around us. 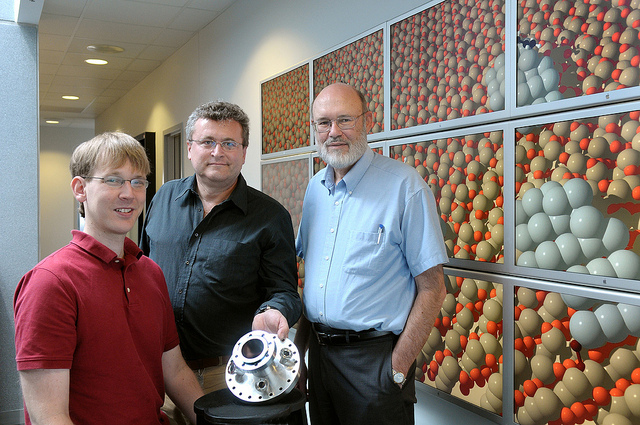 Argonne scientists Jeff Greeley, Stefan Vajda and Larry Curtiss (from left to right) work on creating new catalysts, like this one which reduces harmful by-products in manufacturing processes. Almost everything in your daily life depends on catalysts: cars, Post-It notes, laundry detergent, beer. All the parts of your sandwich—bread, cheddar cheese, roast turkey. Catalysts break down paper pulp to produce the smooth paper in your magazine. They clean your contact lenses every night. They turn milk into yogurt and petroleum into plastic milk jugs, CDs and bicycle helmets. Catalysts speed up a chemical reaction by lowering the amount of energy you need to get one going. Catalysis is the backbone of many industrial processes, which use chemical reactions to turn raw materials into useful products. Catalysts are integral in making plastics and many other manufactured items. Even the human body runs on catalysts. Many proteins in your body are actually catalysts called enzymes, which do everything from creating signals that move your limbs to helping digest your food. They are truly a fundamental part of life. Small things can have big results. It can make things greener. Industrial manufacturing processes for plastic and other essential items often produce nasty by-products which can pose hazards to human health and the environment. Better catalysts can help solve that problem. For example, the same silver catalyst actually produces fewer toxic by-products—making the whole reaction more environmentally friendly. At its heart, a catalyst is a way to save energy. And applying catalysts on a grand scale could save the world a lot of energy. Three percent of all of the energy used in the U.S. every year goes into converting ethane and propane into alkenes, which are used to make plastics, among other things. That’s the equivalent of more than 500 million barrels of gasoline. Catalysts are also the key to unlocking biofuels. All biomass—corn, switchgrass, trees—contains a tough compound called cellulose, which has to be broken down to make fuel. Finding the perfect catalyst to disintegrate cellulose would make biofuels cheaper and more viable as a renewable energy source. Often, we have no idea why they work. The precise reasons why catalysts work are often still a mystery to scientists. Curtiss works in computational catalysis: using computers to tackle the complicated interplay of physics, chemistry and math that explains how a catalyst operates. Once they’ve figured out the process, scientists can try to build a catalyst that works even better by simulating how different materials might work instead. Potential configurations for new catalysts can run to thousands of combinations, which is why supercomputers are best at dealing with them. When Edison was building the lightbulb, he tested literally hundreds of different filaments (likely testing the patience of his lab assistants as well) before discovering the carbonized filament. By taking advantage of supercomputers and modern technology, scientists can speed up the years of testing and expense to get to breakthroughs. Curtiss runs simulations on Argonne’s Blue Gene/P supercomputer to design possible new catalysts. ​“As supercomputers have gotten faster, we’ve been able to do things we’d never have been able to do 10 years ago,” he said. They could be essential for the next big revolution in batteries. Newly efficient lithium-ion batteries helped turn clunky car phones into the slim, elegant cell phones and laptops available today. But scientists are already searching for the next revolution in batteries—one that could someday make a battery light and powerful enough to take a car 500 miles at a go. A promising idea is lithium-air batteries, which use oxygen from the air as a primary component. But this new battery will require totally revamping the internal chemistry, and it will need a powerful new catalyst to make it work. A lithium-air battery works by combining lithium and oxygen atoms and then breaking them apart, over and over. That is a situation tailor-made for a catalyst, and a good one would make the reaction faster and make the battery more efficient. How do you make a new catalyst? Understanding the chemistry behind reactions is the first step; then scientists can use modeling to design potential new catalysts and have them tested in the lab. But that first step is difficult unless you can get down to the atomic level to see what is happening during a reaction. This is where big scientific facilities like Argonne’s Advanced Photon Source (APS) shine. At the APS, scientists can use the brightest X-rays in the United States to track the reactions in real time. At the laboratory’s Electron Microscopy Center, researchers take photos of the atoms while they react. Curtiss and the team have used both of these in their search for better catalysts.